Going on a motorhome trip with a child can be a lot of fun, and one way to make it even better so is to involve the child i.e. ask him/her what he/she wants to eat, to bring along and where you will go. You should also include activities that the child will enjoy, such as swimming, riding a bike, hiking etc. so they will be excited to travel on the motorhome. Give the child a bag where he/she can pack favourite toys or books, and bring along easy to prepare meals. There are few things more difficult than preparing a meal while you’re busy attending to other things in the motorhome, so get quick easy foods. Include some delicious health snacks like dried fruit, biscuits, cereal bars etc., and yes, a bit of junk food here and there to keep the child satisfied. Note: don’t bring any crumbly or sticky junk food as well as sugary drinks, because they will necessitate frequent trips to the toilet. Don’t forget hats and sunscreen especially if it’s summertime, and of course a first aid kit is mandatory. If the child or anyone else on the trip is taking medication, bring along enough supply to last the duration of the trip. A child can get bored easily, so you should stock up on DVDs, books, music CDs and other things that will keep the kid occupied. You can also ask the child to help with some basic tasks, which keeps them occupied and at the same time be helpful. While you’re on the road driving, ask your companion to act as a guide, and point out the different buildings and scenery that you’re passing. The trip is meant to be enjoyed, so don’t rush it. You should also take the age of the child into consideration when planning the trip. As a rule, a young child should not travel more than five hours per day, and that’s probably a rule that adults will subscribe to as well. To avoid fatigue and weariness from setting in, take a break every couple of hours and stop. Go outside your motorhome with the child and stretch out. Enjoy the fresh air and just take in the sights and sounds, and you don’t have to worry about the child getting restless during the trip. Also, give the child a specific space inside the motorhome he/she can call his own, and it will keep your motorhome clean. And if you are looking for some peaceful drive time, schedule it during late at night or early morning when the child is sleeping. This way you can focus on driving without any distractions getting in the way. One more thing needs to be said, and it’s that you must have motorhome travel insurance. 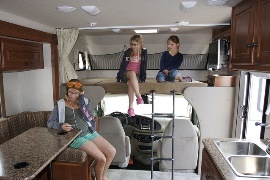 Anytime you go on a trip with the kids it’s imperative that you plan for everything, and getting motorhome travel insurance is necessary so whatever happens, you’ll be well prepared.